Two Bears Farm and the Three Cubs: New Peeps! It seems like Buddha Hen has been brooding forever, but in reality it has only been 3 weeks. And we have some new chicks as a result! This one came from one of the small, white eggs, so it's either a mini Priscilla, Elvis, or Little J.P. Still some eggs that haven't hatched, but we're hoping for a some more chicks before the end of the day! We have a friend that wants as many as we will pass along, and we want to keep a few for ourselves too. Edited to Add - We have 3 more chicks this morning, so a current total of 6! Plus 4 more eggs that could potentially hatch today. I bet the boys love watching the chicks. This is so exciting. I will have to stop back and see if more chicks are arrived. they are SO cute!!! congratulations to your little broody hen! They really so tiny and cute. Sweet! Can't wait to see them grow! Awww, they are adorable. I've said before but what a neat atmosphere you live in. The kids must just love seeing little chicks! 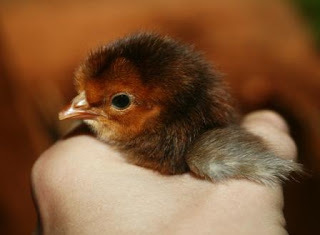 How fun is that, you hatching (well your hen) hatching baby chicks! We have never done that here. Well for one we don't have a rooster :O). Tell me those peeps of yours are as soft as they look! OMG! SO adorable! How cute, Love these pics! Adorable is the word to describe these pics! They are so sweet! 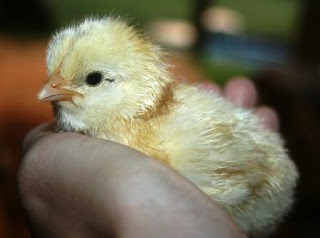 I love baby chicks. So I am jeaous of your peeps. Too fun! Oh how sweet! 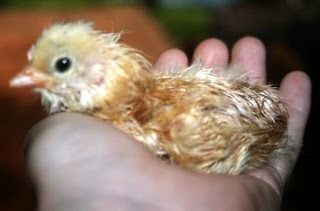 I love baby chicks. Let's hope it was "Little JP"!!!.. "big JP"
They're too cute Lisa! I hope they all hatch! I'm with JP on the naming of Little JP! How in the world did you get those babies away from their momma? There is a man down the road that has a lot of chickens. Several have little ones following around after them. That's a cute sight to see! How wonderful. They are so cute too. What a great blog you have! I am a grateful follower! Congratulations on the babies! They are so adorable. I have a goose (or two or so) that have been on their nest for about seven weeks with a total of one gosling. Sometimes too many moms isn't a good thing!